This "utterly" hilarious tale is sure to be a new favorite. The story starts by describing Farmer Browns problem. The cows have found an old typewriter in the barn. "All day long he hears Click, Clack, Moo. Click, Clack, Moo. Clickety, Clack, Moo." Is it possible?.... Cows that type! Farmer Brown soon finds that his cows are using their new typing talent to make their life better. The barn is very cold at night. When Farmer Brown refuses to provide the electric blankets, the cows go on strike. They leave a note "No milk today!" The cows soon have the hens on their side and again type their demand of electric blankets. Once again the farmer refuses. Well, no blankets... no milk or eggs. Finally Farmer Brown takes matters into his own hands and types a letter to the cows making his own demands for milk and eggs. The letter is delivered by way of a neutral party duck. Soon the two sides reach an agreement. The farmer will supply the electric blankets if the cows give him the typewriter. Sure enough, the cows and hens where fast asleep in the barn with their electric blankets. But what happened to the typewriter. Farmer Brown will know in the morning when he hears "Click, Clack, Quack!" 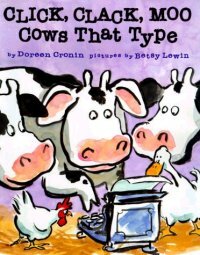 Betsy Lewin's wild line and bright watercolor illustrations are a perfect match for this "moo"rvelous story. The wonderful illustrations capture the humor of the whole situation.